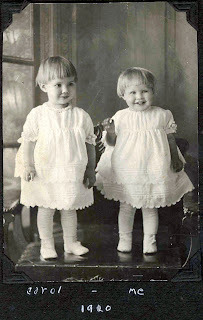 This is a picture of Ruby and her cousin Carol. Carol is the daughter of Grandma Bollingmo's sister. This is my favorite picture, although all of these photos are priceless. No one knew who the baby was in the last posting. I am really suprised that Greg Tober didn't know who it was. These pictures are from the Bollingmo side of the family. There are a lot of Mom's friends and a lot of her family. The picture of Mom holding Joanne is pretty cool for me because rumor has it that Joanne helped carry me out of the hospital when I was born.